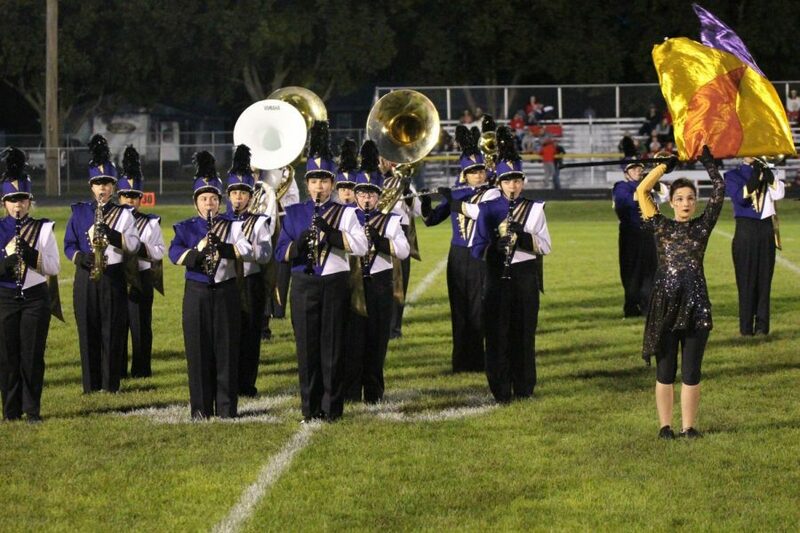 Members of the HHS Marching Band perform during the halftime of a recent football game. The HHS Marching Band theme is “The Portrait of Dorian Gray,” and tells the story of a man who sells his soul to a painting of himself to maintain eternal youth. They have been working hard to deliver this story since late July. “This year, band has finally helped me to feel like a part of something,” explained senior Hannah Watson. This is her fourth year participating in the school’s marching band. The band has already participated in the UNK Band Day where they earned first place for their parade performance. They also were given judges’ feedback evaluating their field show technique. “The field show wasn’t competitive, but we still got great feedback from judges to see later to help us continue to push towards being successful and having a comfortable and fluent show,” said Mr. Halvorson, HHS Band Director. They will continue to work hard with practices early morning before school and during home football game performances. They are planning on competing at Harvest of Harmony on October 6th, and NSBA State Marching Contest on the 20th.